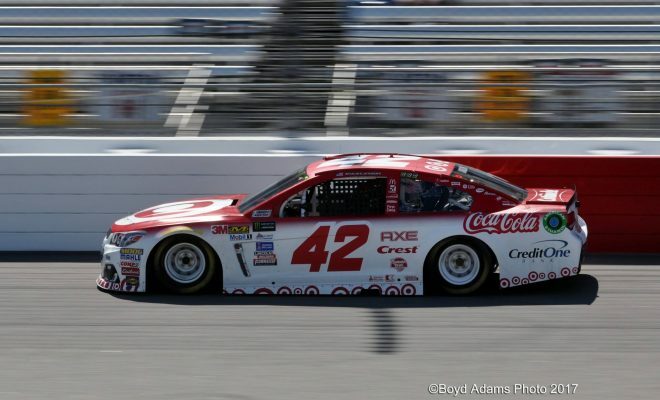 RICHMOND, Va. – Kyle Larson was the fastest car in final practice Friday in preparation for Saturday Night’s Federated Auto Parts 400 at Richmond Raceway. Larson, who was fifth quickest in opening practice, laid down a lap time of 22.426 at 120.235 MPH. Joey Logano and Daniel Suarez were second and third quickest with lap times o 22.461 and 22.514, respectively. Martin Truex Jr. paced opening practice but fell to fourth on the speed charts for final practice with a lap of 22.557 a=t 119.697 Mph. Rounding out the fast five was Matt Kenseth with a lap time of 22.582. Coors Light Pole Qualifying comes up at 5:45 Friday.